Birmingham AL Electrical Service & Certified Electricians offering top quality Electrical Service & Superior workmanship at affordable rates to Birmingham AL & surrounding areas.We provide Certified Electrical Services & Technicians at rates well below the Industry Standard.Our State Certified Electricians will insure your project(Large or Small)will be completed according to your expected time frame and within your budget.Our workmanship & customer satifaction is unparalleled. and remain ranked in the top 5% of over 29,000 Contractors within the State of Alabama.We take pride in our workmanship and care about our customers safety. is a State Certified Electrical Contractor. top quality service,workmanship,customer satisfaction & customer saftey. for your safety & piece of mind. 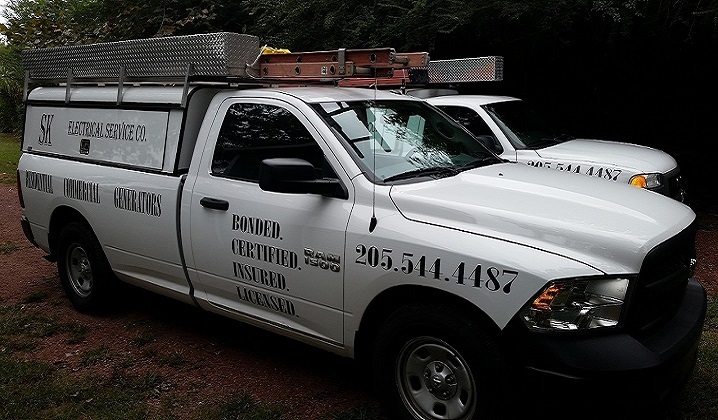 Our certified electricians have been providing top quality electrical services in the Residential,Commercial,Maintenance & Generator Electrical Fields for over 22 years,serving Birmingham & Jasper AL. With our extensive electrical experience & knowledge we take pride in delivering affordable,top quality electrical workmanship & superb customer satisfaction to all our clients.Give us the opportunity to serve your electrical needs,join our clientele of satisfied customers. Please take a moment to enjoy our company video. State Certified Master Electrician On Every Project. SK Electrical Service Co.rates are 20-40% below the Industry Standard for Bonded,Certified,Licensed & Insured Electrical Service Company in Birmingham & surrounding areas.We maintain low overhead company expenses which allows us to pass big savings on to our clients without compromising safety,workmanship quality & customer satisfaction. Allow us the opportunity to prove it,with a free quote. Certified Electrical Professionals You Can Depend On!